Happy Birthday We Should Cocoa and congratulations to Choclette and all the other lovely bloggers who have kept this very nice group going for two years now. September being a month of celebration, the special ingredient was...yes you've guessed it...Cocktails. I was so excited when I read Choclette's post announcing it! I love cocktails, all types of cocktails, Alexanders, Cosmopolitans, Daiquiris, Manhattans, Martinis. Unfortunately I don't get the opportunity to make them at home as often as I'd liked to so it's useless to say that I immediately jumped at the opportunity to make one to celebrate We Should Cocoa's birthday! I can imagine that some bloggers would go ahead and bake cakes and muffins and cupcakes inspired or infused with their favourite cocktails. I went the other way around and made my favourite chocolate cake into a cocktail. Oh! it was so..so good!! Black Forest is my favourite cake. I adore the combination of chocolate and sour cherries and off course the fact that it is moist and creamy at the same time! And I like it even more when it is "drunk" with Kirsch or Cherry Brandy. I can eat a whole cake by myself and order another one for dessert. 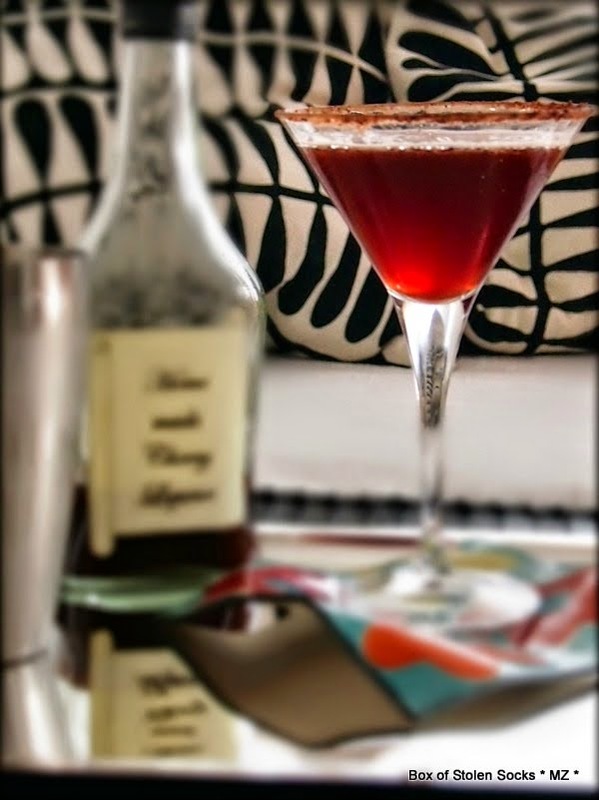 If found this recipe for a Black Forest Manhattan on Saveur.com a while back and I immediately bookmarked it. 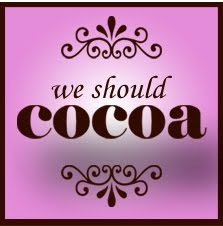 I knew that the day to make would soon come and thanks to We Should Cocoa, I got the chance to try it. It was amazing! Now, I'm no expert , but I think the secret in making an amazing Manhattan is the quality of the whiskey. The other ingredients and mixers are also important but the aroma and the "punch" of the whiskey is the one that lingers and can transform it into a velvety, luxurious experience. I must confess, I used my husbands Single Malt for this one, but I did not regret one bit. It was worth it! I also used my mother in law's home made Cherry Liqueur which was sweet enough to make me decide to skip the 1 cup (!) of sugar used in the original recipe to make the cherry syrup. Mix the sour cherry juice with the cherry liqueur and chill. To Rim the Glass: Mix the cocoa and sugar in a small plate. Pour some sour cherry juice into a wide, shallow bowl. 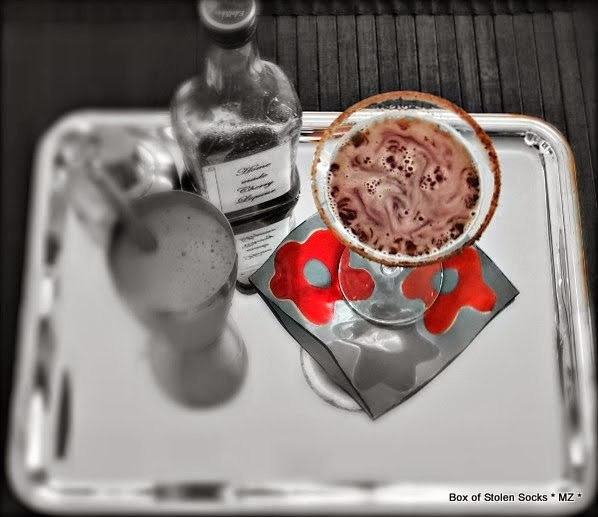 Dip the rim of a martini glass into the juice, then dip it into the cocoa and sugar mixture. This will create a thin chocolate ring around the rim of the glass. 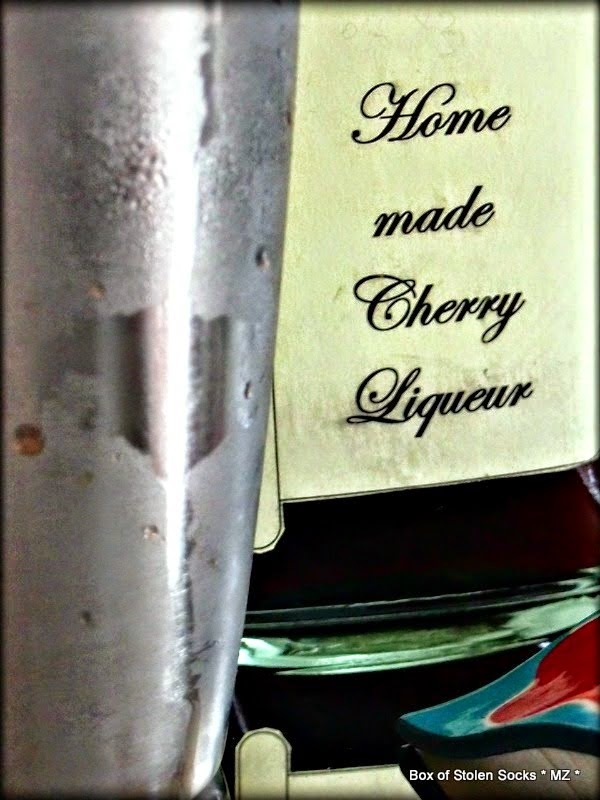 Fill a cocktail shaker with 3/4 ice, add the whiskey, the cherry juice and the chocolate syrup. Shake and pour into the rimmed martini glasses. Oh how fantastic is that. Even though it's still the morning, I'm now craving a glass. Great combination of flavours and I really like using the sour cherries & cocoa to rim the glass - very classy. Thank you for celebrating WSC's birthday and with such a wonderful cocktail too.